Tennessee Wildlife Resources Foundation (TWRF) Bob Hatcher Ornithological Scholarship Fund. Mr. Hatcher lost his courageous battle with cancer in July of 2014. The AEF and TWRA arranged this special eagle release to honor and thank 76-year-old Robert M. Hatcher for his dedication to helping bring our nation's living symbol, the Bald Eagle, back from the brink of extinction. He served as the Non-Game and Endangered Species Coordinator for the Tennessee Wildlife Resources Agency from 1978 to 2001 and served TWRA for a total of 38 years. The name Robert M. Hatcher is practically synonymous with the phrase "Bald Eagle recovery in Tennessee". In the 1960s and '70s, Bald Eagles were on the brink of extinction, with only about 400 nesting pairs in the lower 48 states and no known eagle nests in Tennessee. Since then, strict protection laws, the banning of DDT, and dedicated restoration and recovery efforts have helped restore this majestic species to America's skies. As of January 2014, there are about 143 successful Bald Eagle nests in Tennessee. From these nests, around 250 eaglets fledged in 2013. As of today, the Tennessee Wildlife Resources Agency, American Eagle Foundation and other partners have released 358 captive-hatched or translocated eaglets into the wilds of Tennessee. TWRA Executive Director Ed Carter announced that the establishment of an annual scholarship fund named in honor of Robert M. Hatcher, to be awarded to a biology student with an concentration in Ornithology. The scholarship will be administered by the Tennessee Wildlife Resources Foundation. Eliot Berz is a graduate student at the University of Tennessee at Chatanooga and also works as the Avian Technician for the Tennessee River Gorge Trust in Chattanooga. The second recipient of the Robert M. Hatcher Memorial Scholarship was presented to Mackenzie Roeder, a graduate student at Austin Peay State University. 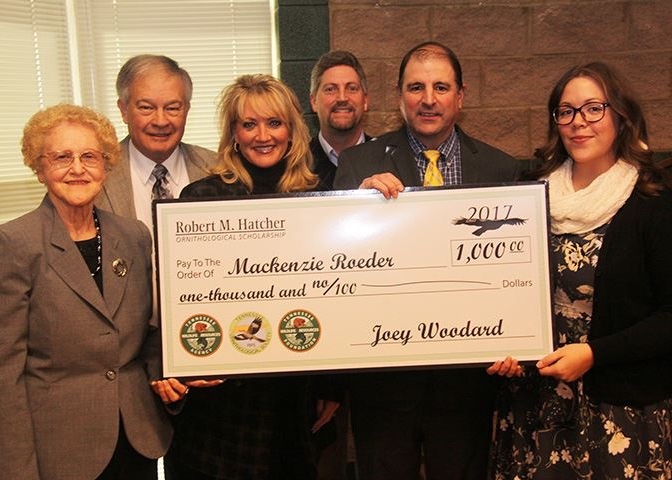 Mackenzie was recognized and presented the award at the January meeting of the Tennessee Fish and Wildlife Commission on January 25, 2018. Megan Hart, a graduate student at Austin Peay State University, was the first recipient of the Robert M. Hatcher Memorial Scholarship. The $1,000 scholarship was presented to Megan on August 15, 2016, on the campus at Austin Peay.